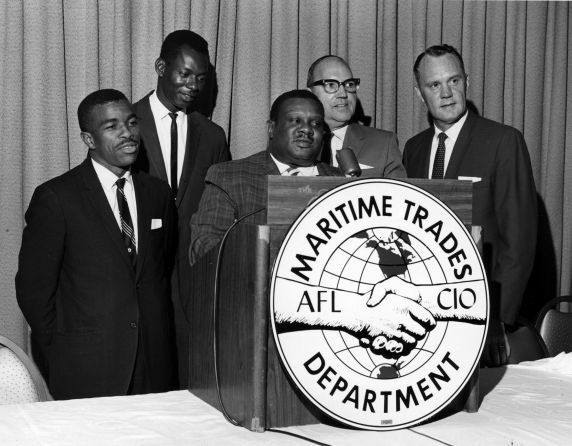 The AFL-CIO Maritime Trades Department (MTD) helped support striking members of AFSCME Local 1733 in Memphis during their 1968 strike for recognition, during which Martin Luther King, Jr. was assassinated. Here, AFSCME leaders speak at an MTD meeting. From left: Jesse Epps, AFSCME International Representative instrumental in the Memphis campaign; William Lucy, Associate Director of AFSCME's Legislation and Community Affairs Department and an important leader during the strike; speaking, T. O. Jones, President of Local 1733; Peter M. McGavin, MTD Executive Secretary-Treasurer; and Robert Bollard, Director of AFSCME's Legislation and Community Affairs Department.